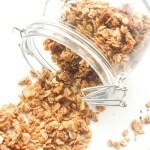 Give yourself a healthy start to your day with some homemade coconut maple walnut granola. You will never go back to that high-sugar store-bought stuff! In a large bowl, combine the oats, walnuts, almonds and pecans and stir to combine. In a medium bowl, mix together the maple syrup, coconut oil, vanilla and cinnamon. Stir well to combine. Pour this mixture to your large bowl or dry ingredients. Using a wooden spoon, stir well to combine. Line a cooking tray with aluminum foil or parchment paper and spread the granola mixture evenly. Bake for 30 minutes. Every 10 minutes, take the tray out of the oven and give it a good stir. Re-spread the granola and put back in the oven. Once done, remove the granola from the oven and let cool completely.